Is your business just “great”? It’s time for an upgrade my friend. As someone who spends most of her working hours around small business owners and entrepreneurs, it never ceases to amaze me that so many of them use words like “great” and “unique” when describing their created-from-the-ether brands. Great? 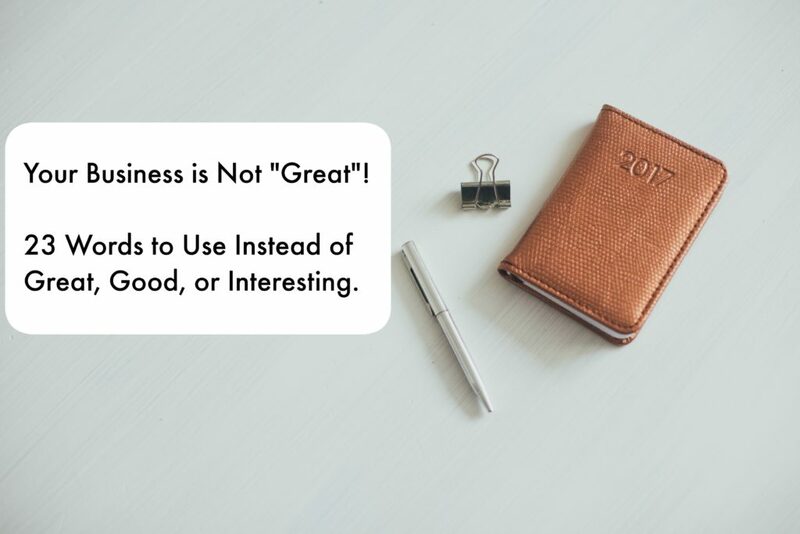 Great is like the wobbly, basic-tasting, cafeteria Jello of descriptions that leaves me feeling like your business is, well, anything BUT great. Descriptions like “good” and “interesting” often make me feel the same way. I know you can do better than that! That said, I also know that sometimes your brain is busy spinning 100 other plates in the air to keep it going, and that creative content creation isn’t at the top of your massive to-do list, so I’ve made you a “Great Replacement List” to help you diversify the descriptions in your marketing content, blog posts, emails – heck even your tweets! Sounds great? Heck no it doesn’t! It sounds STUPENDOUS! How do you keep your copy and biz out of the boring copy rut? Any favorite descriptive words exciting you these days? Share them with us in the comments below!